Mark Jilg of Craftsman Brewing Co.
I’ve finally accepted that San Diego Beer Week is about going with the flow. With so many events going on, so many beers to drink, and so many people all trying to do the same sacrifices have to be made. I had plans to go to the San Diego Brewer’s Guild Festival yesterday, I even had tickets waiting for me, but I never made it down there. From those I’ve talked to that were there a great time was had by all. Mayor Jerry Sanders tapped a cask to kick things off and the party just kept going from there. So what was I doing that meant missing the Guild Fest? 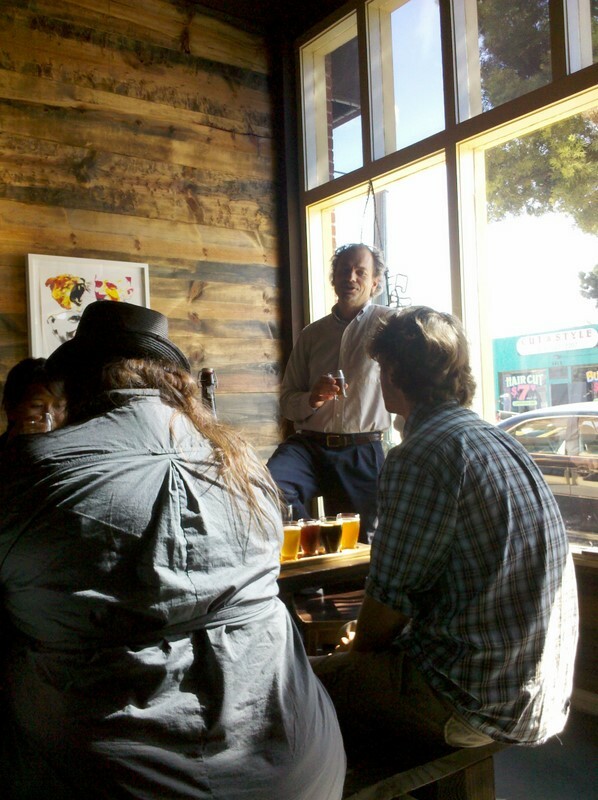 I was at Blind Lady Ale House’s Brewmaster Series with Mark Jilg of Craftsman Brewing Co. Owner and Brewer Mark Jilg made the trip down from Pasadena to talk about his beers and share some stories about the brewing process. Craftsman Brewing Co.’s beers are unique and fairly unconventional, when asked about the use of corn (which many people look down upon when used in beer) in their 1903 Lager Jilg responded, “Rules are for people that want to be ruled.” I think that quote could accurately describe their outlook on brewing. Jilg explained that he sees their beers fit into three different catagories: those that are approachable and easy drink, basically liquid refreshment. The second catagory is beers in which they want to make a statement to the beer community. And last are beers in which they are trying to figure out and focus on an interesting part of the beer palate. Craftsman Brewing Co.’s beers are currently only available on draft, mostly in the Southern California area. They have had an operational bottling line for years, but do no currently bottle their beers. If things go according to plan they should start bottling next year. So, on to the beers. The Craftsman Brewing Co. flight at Blind Lady Ale House included Poppy Fields Pale Ale, Fireworks Saison, Triple White Sage, Cabernale, Edgar’s Ale, and Sour Lavender. In addition to those beers Jilg brought two additional growlers down for the tasting, Bourbon Barrel Aged 1903 Lager and Aurora Borealis. Poppy Fields Pale Ale is an English pale ale. It’s not overly hoppy and is pretty dry. This was the most approachable beer of the tasting. I’d like to try a full pint of it though to really get a feel for it. Bourbon Barrel Aged 1903 Lager. 1903 Lager is an excellent beer, a pre-prohibition lager which uses 2-row malt and corn and has a distinct cereal taste to it. This barrel aged version had a strong but not overly sweet coconut smell and taste. The finish was very reminiscent of the cereal taste of the non-bourbon barrel aged version. They decided to bourbon barrel age this light lager (it’s about 5.7% ABV) because there are very few beers like this aged in barrels. Fireworks Saison is barrel fermented with brettanomyces yeast, but it’s not as funky as one might expect. Many saisons add herbs or spices but not Fireworks, it is solely water, grains, hops and yeast. It uses a high amount of American hops and when fresh is much hoppier than what we tasted yesterday. As it ages it mellows out and becomes a bit funkier, but is still a pretty approachable beer. As Craftsman continues making Fireworks and using the same barrels to ferment it the beer should evolve with the aging of the barrel. Triple White Sage was the first beer I had from Craftsman. It’s 9% Belgian-style tripel with white sage. It has a strong sage smell and just enough sage in the taste to make it pleasant but it’s not overpowering. Jilg harvests all of the sage himself which seems to make this a more personal beer to him. This beer is dependent on his local climate, he must be careful not to over harvest sage or else there won’t be enough for the next year. Cabernale uses Central Coast Cabernet grapes in addition to all the usual beer ingredients. The grapes are crushed and added to the fermenter and then the wort is cooled and added as well so they ferment simultaneously. It has a strong grape juice smell and definitely has hints of red wine. Edgar’s Ale is a dark beer inspired by Edgar Alan Poe. It’s black and strong, but Jilg says it isn’t an Imperial Stout, nor a porter. Purposefully vague this beer is meant to inspire mystery and intrigue. It has hints of wood and whiskey. I believe Jilg said there was no roasted barley used, but myself and many others picked up distinct roasted flavors reminiscent of coffee. Sour Lavender was the beer many people singled out as their favorite. I personally don’t like lavender much, but really enjoyed this beer. The lavender is mostly in the aroma, and it has a very strong smell of lavender, but the beer itself is very tart. The first sip can almost be overwhelming, but as your taste buds get used to it this is an amazing beer. Aurora Borealis was the last beer we tried, inspired by the aurora Borealis in the night sky this is another beer that is hard to classify. At 13% ABV it’s the strongest beer they have made. It’s aged in their oak fermenter for 11 months and is pretty dry but the standout smell and flavor is mint. It’s a fairly light colored beer and looks nothing like it tastes. There seemed to be so much going on in the beer it was hard to taste it all with a small 5oz sample. In addition to the Craftsman beers I also tried Automatic Brewing Co.’s new Belgian-style white beer, Light Whitening, I didn’t see the exact ABV but it seemed fairly low, probably around 5% and was very easy to drink and refreshing. Automatic brews in such small quantities this one will be gone soon if it isn’t already, but I’m hoping to try it again with a cleaner palate. I also had an Achouffe N’ice, a strong dark winter beer. It was very malty with a lot of caramel, little hop presence and some fruitness, maybe even the taste of raisins. For coverage of the San Diego Brewer’s Guild Festival at Liberty Station yesterday checkout West Coaster. And click below to see a video of San Diego Mayor Jerry Sanders tapping a cask at the festival. Yesterday the local KPBS morning show These Days had three local brewers on to talk about local beer and the upcoming San Diego Beer Week: Paul Segura, brewmaster for Karl Strauss Brewing Company, Colby Chandler, brewer for Ballast Point Brewing Company and general manager of Home Brew Mart, and Shawn DeWitt co-founder and original brewmaster for Coronado Brewing Company and current Vice President of the San Diego Brewer’s Guild. If you missed it live, you can download or stream the half-hour segment on KPBS’s website. 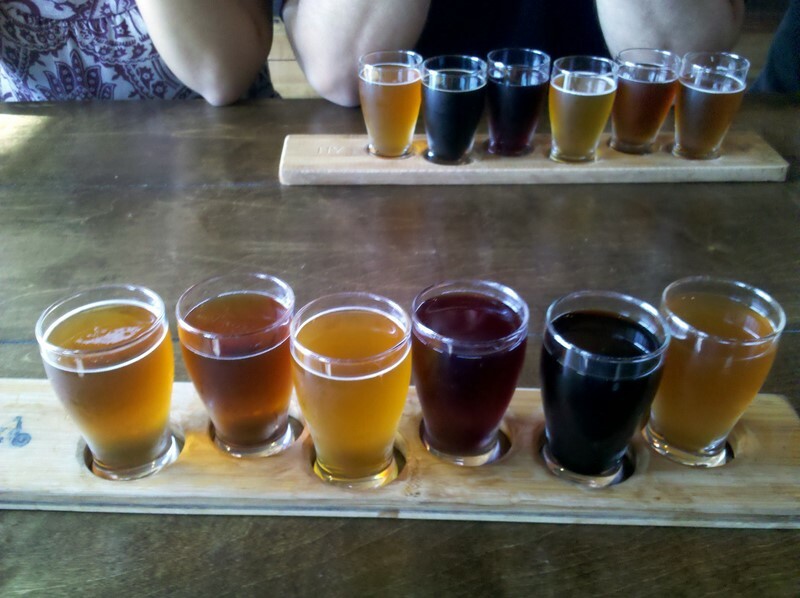 The KPBS Culture Lust blog also took a look at the local craft beer scene yesterday in this post. I haven’t talked much about homebrewing on this blog, mostly because since moving I haven’t been homebrewing much. But I’m a novice homebrewer and plan on getting started back up again once I get a bit more settled in here in San Diego. Rumors have been circulating for a while now, but it’s official, the 2011 American Homebrewers Association Conference will be held in San Diego from June 16th-18th, 2011. 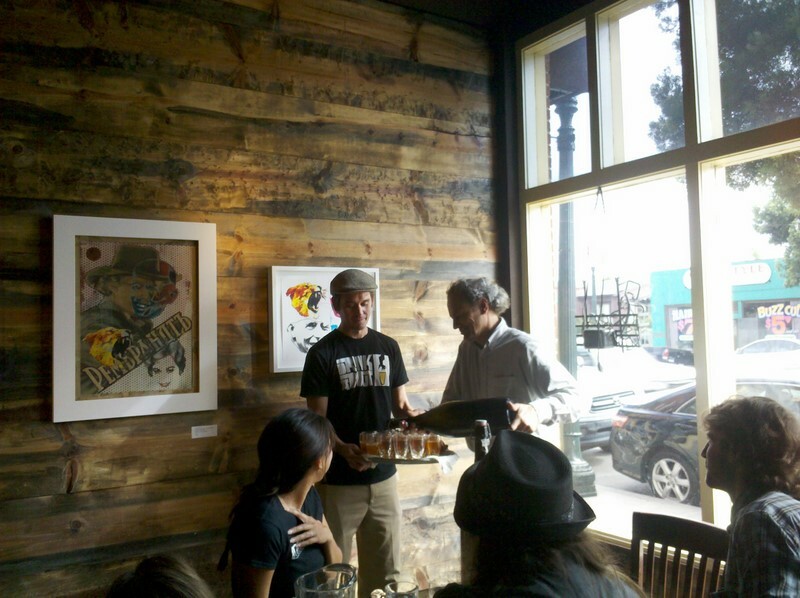 It will be hosted by QUAFF and the San Diego Brewer’s Guild. The conference is just under a year away but they’ve already produced a preview video to get the publicity started. Some Like it Hoppy shows off some of the great things about San Diego and San Diego beer and brewers specifically. Speaking of homebrewing, the latest issue of Zymurgy, the Journal of the American Homebrewers Association, Chuck Slothower of Beer at 6512 wrote a short piece about the beer blogger collaboration we did with Ska Brewing Company. The article focuses mostly on Chuck’s experience, it was his first ever time brewing, but does mention myself and the Belgian-American IPA I brewed with Thomas Larsen head brewer at Ska. Unfortunately the article is not available online, but you can read my blog posts about the experience brewing at Ska at my old blog, Beer N Bikes, here’s a good summary post of the brewing process and here are some pictures of the tapping party.